Yoga is a 5000-year-old practice. The word itself means union: this can be union of mind and body, for health and wellbeing, but at its core yoga is the union of our conditioned self with the universal consciousness. Hatha Yoga is a general term for yoga relating to physical movement, this is the most commonly known form outside of India. Translated from Sanskrit, ha means sun, that means moon, so Hatha Yoga means the union of the sun and moon, representing the male/female energies or concepts of self/other. 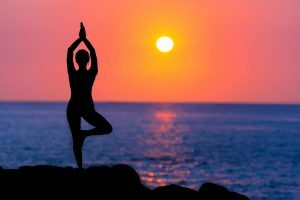 Hatha Yoga is, in fact, a small part of Raja Yoga, one of four main branches of yoga, the others being Karma Yoga, Bhakti Yoga, and Jnana Yoga. These are all different approaches to the development of self-awareness, suited to differing personalities. Karma Yoga is the path of selfless service, which can be interpreted as charitable work. The aim, however, is the development of an attitude of performing all actions for other beings. This reduces our selfishness, helping the realisation of unity in diversity. Bhakti Yoga is the devotional approach to spiritual growth. This is the path of prayer and ritual; belief in, and a relationship with, God or Gods, is key in this form of Yoga. Jnana Yoga is the practice of applying the intellect to enquire into the nature of life, the universe, and everything. A large part of Jnana Yoga is using the mind for self-reflection, study of scripture and philosophy. Jnana and Bhakti tend to balance each other since devotion can turn to fanaticism without understanding and the intellect can be a source of excessive pride without devotion. Yamas: Restraints; such as non-violence and truthfulness. Niyamas: Observances; for example purity or surrender of the ego. Asanas: Steady pose; develops physical strength and wellbeing. Pranayama: Breathing Exercises; the control of life force and getting to know the subtleties of the body/mind system. Prana is also known as Chi. Pratyahara: Sense Withdrawal; diverting the senses from the physical world and turning them inwards. Dhyana: Meditation; concentration is fixed on the closest possible thing to eternity or the infinite. Samadhi: Transcendence; one goes beyond the ordinary self, realising the true unity of self and non-self.